We're not all business, and we know how to have a good time. 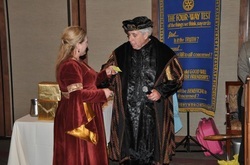 Each year, the West Covina Rotary "throws out" the president for that year, and welcome the new administration. It's a night of laughs, entertainment, and good memories. Members, their families, and guests of the club are invited to this special event. You won't experience anything like it.